Online or telephone coaching with EFT (Emotional Freedom Technique) is a wonderful way to release energy blocks as you progress with your goals and create a happier, fuller and more peaceful life. EFT involves tapping acupressure points on and around your face, hand and upper body while repeating words and phrases that relate to the emotional or physical issue you want freedom around. As your EFT coach, I’ll teach you how to use this tool effectively for yourself. The video below shows how to try it for yourself if you’re not ready for a session or if you’d like to do it yourself between sessions. Click the videos to see clips from my studio guest slot on the live webcast after Michael Gavin’s workshop at the British Association for Counselling and Psychotherapy (BACP) Private Practice conference on trauma, London, September 2015 (with studio co-hosts Anne Scoging and Karen Lloyd). Often, a conversation will bring up something for the client that EFT tapping can easily resolve. This can be integrated into counselling, coaching, yoga therapy and other sessions when appropriate. As well as my talking and guiding you through it during your session/s, you might want to learn how to do it yourself so you can clear energy blocks yourself anytime, anywhere. Some clients learn how to use this wonderful self-care tool themselves in under six sessions, others need a few more. * teach you how to use EFT effectively on yourself as an everyday or occasional self-help tool. Studies show that when the person using positive affirmations doesn’t believe what they’re saying, this can actually lower self esteem. Telephone or online coaching with EFT or online counselling with EFT allows clients to acknowledge their fears, no matter how scary (or silly) they feel about them. Once you’ve done this, the positive affirmations are much easier to believe because you will have dealt with the negatives. Sometimes, online or telephone EFT works so quickly and easily that people think they imagined their issue as being worse than it was. 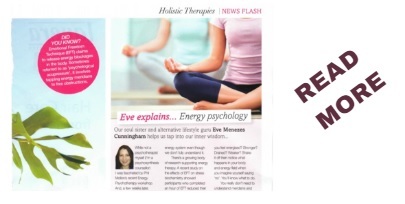 EFT helps clear your energy field leaving you feeling ready to move forward. Recent studies have been really promising in showing EFT’s efficacy in supporting people struggling with PTSD. A 2012 randomised control trial (Church, D; Hawk, C; Brooks, A et al) of 54 military veterans with PTSD left all participants no longer meeting criteria for PTSD after 6 sessions of EFT. A 2011 randomised control trial pilot study (Church, D; Pina, O et al) looking at the effects of EFT on intensity of traumatic memories of abused adolescents found that after a single EFT session, none of them met the criteria for PTSD and the effects remained when revisited after 30 days. And it’s looking good for people struggling with stress, too: A randomised control trial (Church, D; Yount, G and Brooks, A) on the effects of EFT on stress biochemistry published in the Journal of Nervous and Mental Disease found that the group who received an hour of EFT showed cortisol (a hormone released under stress) level drops of 24%. The other groups (receiving an hour of talk therapy and no treatment respectively) showed no change in cortisol levels. 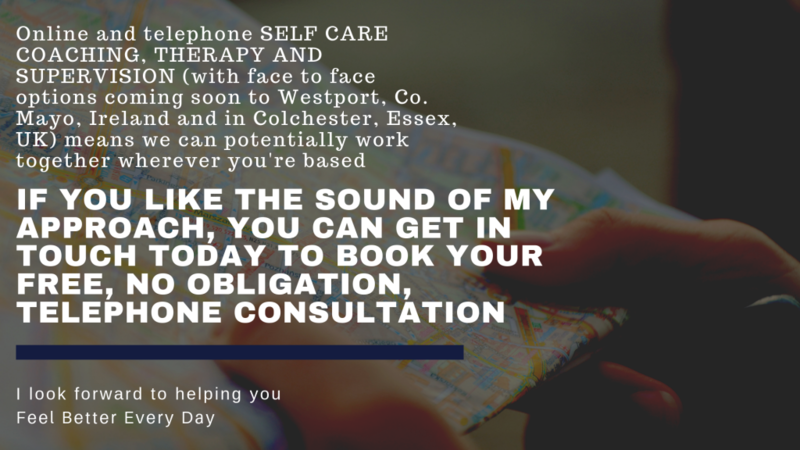 When we speak, you can book some online or telephone EFT on its own or have it as part of your telephone or online coaching, telephone or online counselling process if you’re finding yourself blocked in any way.